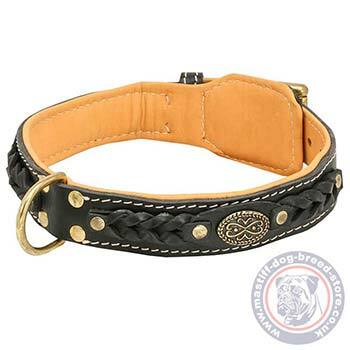 Choose this handmade leather dog collar with nappa lining, braids and brass medals. Sizes: 19-40 in (48-100 cm). Colors: black, brown, tan. Handmade leather dog collar for Cane Corso is a special exclusive designer dog accessory, one of the most favorite dog collars of our customers! This royal dog collar combines a list of benefits, that makes it super comfortable, luxury looking, durable and practical in use. 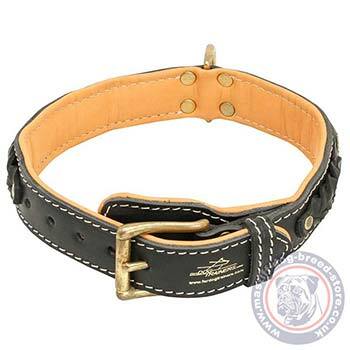 First of all, this Cane Corso collar has a classic design with a buckle, that allows to regulate its size while dog is growing or losing weight or to use it for several dogs of various sizes. There are 5 holes each on distance of 1 each from each other. Royal Cane Corso collar is handmade by our experienced craftsmen, reliably well-done and stitched by hands. We use only genuine, soft and thick, top quality leather to create a reliable tool for regular use. Store this collar properly and it will serve you for many years even if used regularly! Make your dog look gorgeous! Soft calve lining makes a dog feel comfy, saves from rubbing and adds nice look to the collar. 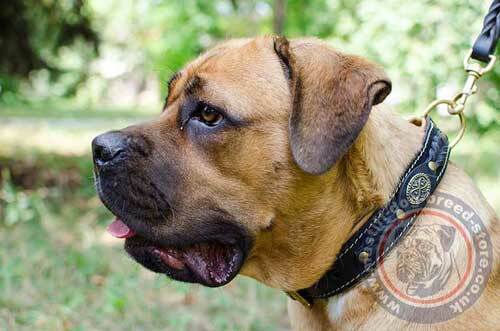 This royal Cane Corso collar is decorated with leather braids and brass brooches. All the details are reliably riveted. Exclusive Design for Neapolitan Mastiff Perfect Look! 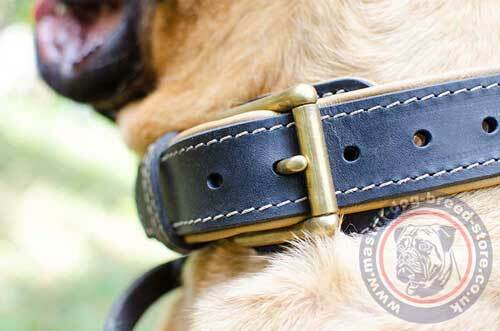 Designer dog collar with baided design and soft nappa lining is handmade by professionals. The hardware is safe polished, reliably fixed and rustproof. All the leather edges are polished and waxed for long-term perfect look and reliability in use.